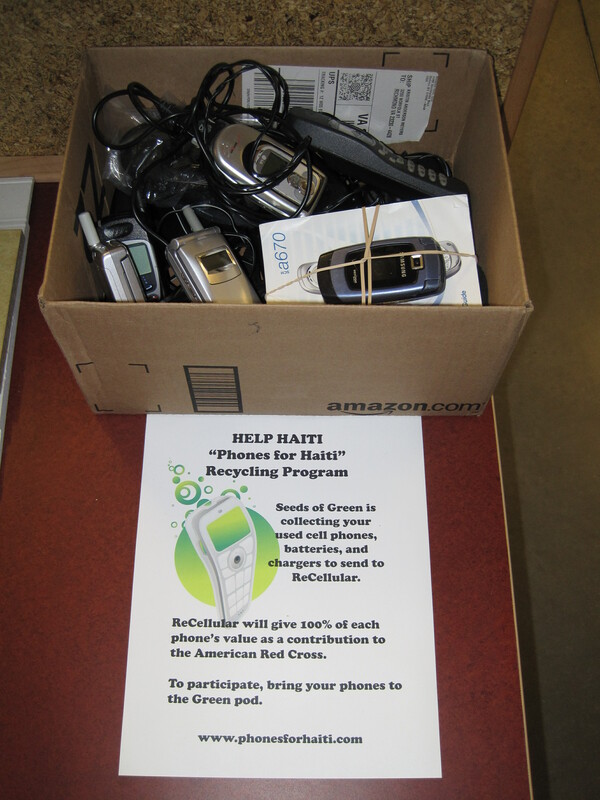 The cellular items that were collected for the Phones for Haiti program were sent off to ReCellular at the end of February. Throughout all of the Moseley offices we collected about 35 assorted phones and chargers. Thank you to everyone who contributed! As we welcome warmer temperatures and (we hope) sunnier skies, you may think about sprucing up your home and undertaking the traditional spring cleaning. But hold that thought. Before you reach for the products you currently have in your cleaning arsenal, consider what you may be adding to your indoor environment. Thousands of chemicals are manufactured every year, and only a small percentage of them are tested before being released for use by consumers. Thirty percent is a conservative number. That means a lot of what you could be using most likely was not tested for impacts on human and environmental health. These chemicals include those that are not only irritating to skin, eyes, and lungs, but that may also be carcinogenic or capable of disrupting your endocrine system. Some are also bioaccumulative, meaning they build up in fatty tissues, and you’re body won’t break them down. Consider, for example, that many cleaning products contain synthetic fragrances. These are actually phthalates, the same chemicals that leach from some types of plastic. I know what you’re thinking. How much is it going to cost me to buy the environmentally-friendly (and people-friendly) cleaning products? 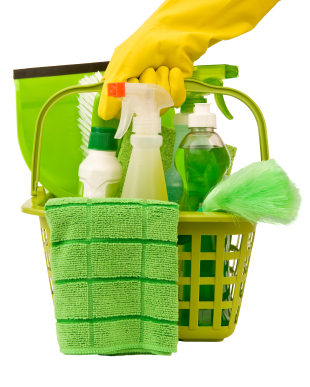 There are two good options for green cleaning. You can buy alternative products that contain plant-based cleaners and oils. These products do cost a bit more, but keep in mind that they are usually much more concentrated than the synthetic brands and will go farther. Brands such as Seventh Generation, Ecover, Method, and Mrs. Meyers are some common brands to look for. Glass cleaner: Mix water and ¼ cup white vinegar or 1 tablespoon lemon juice. Put all ingredients in a spray bottle, shake, and use as you would a commercial brand. All-Purpose Cleaner & Scrub: Mix a little baking soda or washing soda (wear gloves) with water for a scrub, or mix vinegar with water for a more mild cleaner. Apply to surface and wipe off with a rag or a sponge . You can add a dab of liquid soap to the scrub to create a thicker paste. Disinfectant: Try straight vinegar on most surfaces to kill bacteria, mold, and viruses. To kill food-borne pathogens, though, you’ll need the traditional hot, soapy water. Oven cleaner: Create a paste of water and baking soda and apply to oven surfaces. The more grease and grime, the more you’ll need, so be generous when applying. Let stand overnight, then scrub off. Furniture polish: Mix 1 teaspoon olive oil with ½ cup white vinegar or lemon juice. Dab a soft rag into the solution and wipe onto wood surfaces. Drain cleaner: Pour ½ cup baking soda into drain and follow with 2 cups boiling water. If the drain is still clogged, chase the baking soda with ½ cup vinegar, let stand for a few minutes, and flush with one gallon of boiling water. Set your mower as high as possible. This allows the grass to grow higher and shade the weeds that compete for sun. This also allows the soil to retain moisture better, so less overall watering is required. Mowing the grass short promotes rapid growth, as the blade area is needed to provide sugar to the roots. Watering infrequently promotes deeper root growth and favors grass over weeds which typically have shallower roots. Water only when the grass shows signs of stress and do not water too deeply, as it can wash away nutrients in shallow soil. Fertilize with organic fertilizer in the spring and fall. Avoid chemical fertilizers, since they are typically salty and drive away the worms that aerate the soil and add nutrients.